The burgeoning world of esports is putting gamers of all ages in the public spotlight. With the new industry sector still in its infancy, many executives are creating a strategy to develop youth gamers. 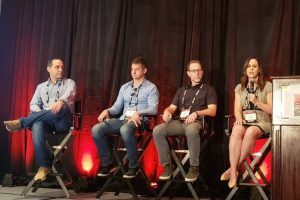 At the recent 2018 SVG Esports Production Forum in Los Angeles, execs from the Big Ten Network, Twitch, UCI Esports, and Super League Gaming touched on the need to help gamers mature and evolve, improve the current state of amateur esports, and supply possibilities for employment for these individuals. In esports, the idea of amateurism is a bit tricky. According to Edelman, player age varies with the game: for example, 6 to 12 years for Minecraft, 14 to early 30s for League of Legends, 15 to early 50s for Clash Royale, any age for Fortnite. With such a large range of ages, organizations are also tasked with presenting even representation throughout. “We wanted to design experiences so that players of multiple skill levels can all have a good experience and compete against other players at their skill level,” Edelman explained. To do so, Super League Gaming operates leagues, promotes activity outside of the organization (other brands, gaming publishers, venues), and produces original content on broadcasts and live streams. Modern gaming often means a lot of negative influences. To combat the possible dangers of online gaming, executives plan to create an inclusive platform that starts by educating parents. The school hasn’t stopped at scholarships. It constructed its own venue in the second year of the program. Like any scholastic institution, the university provides an experience for those outside the gaming realm as well. For example, tech used for the gaming team is implemented in the academic curriculum. Although esports is just beginning to hit the mainstream, there is still some work to be done at the amateur and collegiate ranks. With much opposition from universities entrenched in “stick-and-ball” traditions, it is up to other schools to do the hard work. As for the more popular schools, there is work being done. The Big Ten Network has recruited all 14 conference members for competitions, and, as the sport continues to grow, the need and relevance for broadcast events becomes more and more apparent.